SmartChlor® Technology - the self-regulating chlorine that works together with FROG minerals is an easy to use @ease Floating System. Fresh Mineral Water® provides benefits that’s cleaner, clearer, softer and easier™. The unique properties of SmartChlor Technology use up to 75% less chlorine* and greatly reduces hot tub maintenance like shocking. The unique SmartClor® Technology slowly releases over 3-4 weeks and flips over when it is time to replace the cartridge. This replacement pack comes with 3 replacements. For use in any hot tub up to 600 gallons. 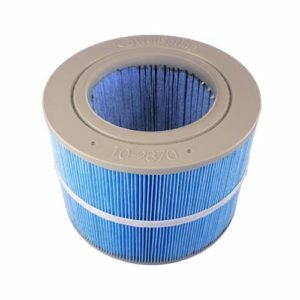 Bullfrog Spa Replacement filter for A, R, and X series models years 2013 – 2017. BlueWater Salt System not only maintain pristinely clean water, but it makes your water feel soothing and silky! The Salt System creates a safer and cleaner spa experience by eliminating the need for harmful chemicals, floaters, or any other chemical regimens as well as keeping your spa 100% chlorine free! No unpleasant chemical odors, dry skin or itching! This product provides sodium bromine reserve in your hot tub water that a bromine generator will use to produce bromine. Designed to use with bromine generators such as BluFusion and Isis bromine generators or any Genesis Water Sanitization systems.